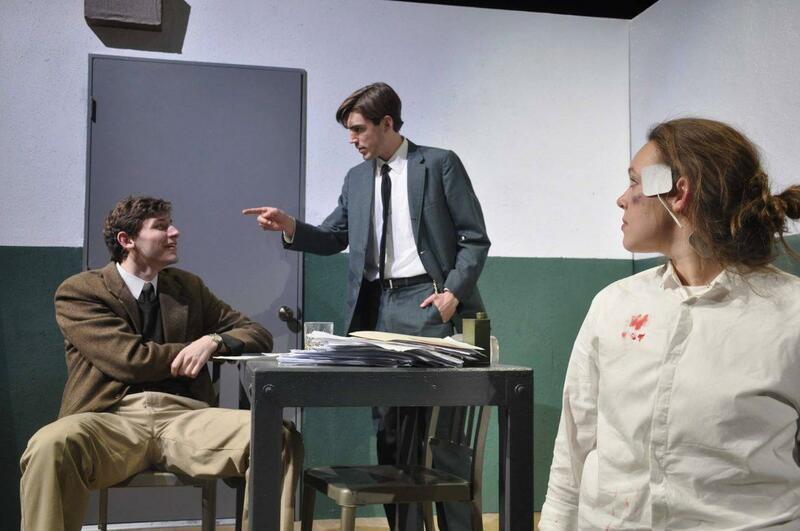 Martin McDonagh’s “The Pillowman” is a gruesome and disturbing investigation of the very nature of art. Photo courtesy of Cap & Bells. Cap & Bells’ latest show, The Pillowman, is a masterful adaptation of a dark classic. The play, written by Martin McDonagh and directed by John Murphy ’21, was performed on Nov. 16 and 17 in the Directing Studio of the ’62 Center. The performance, though long, was wonderfully carried out by the five actors: Julia Tucher ’21, Jack Romans ’20, Owen Foster ’22, Peter Duke ’21 and Allison Li ’22. They were stunning in their depictions of troubled characters struggling with childhood traumas. This was not easy to do. The play, defined as a “dark comedy,” is a troubling account of suffering and the violence depicted against children throughout the show is extremely disturbing. Set in an imaginary authoritarian regime, the play tells the unsettling story of Katurian (Tucher), a writer of short stories who is arrested and interrogated by two police officers for the gruesome content of his tales, which depict violent child murders. Coincidentally, the stories are similar to murders that the detectives have been investigating, and they suspect Katurian to be linked to them. As the story unfolds, the detectives Ariel (Foster) and Tupolski (Romans) reveal details about their own traumatic childhoods, involving alcoholic and abusive fathers, as the reason for their wills to protect children. The last main character, Michael (Duke) – brother of Katurian – adds another layer to this traumatic story. As part of their parent’s evil plot, Michael was hidden from his brother and tortured for seven years, while Katurian heard all of it. The goal was to make Katurian a “great writer.” The parents’ physical and psychological torture of both of their children leads Katurian to murder both of them, smothering them with a pillow in their sleep. The parents’ gruesome “experiment” forces their two sons to live in a world where right and wrong are blurred. Michael is defined as “slow to catch on,” and does not seem to grasp reality. He interprets Katurian’s tales as orders, and kills children based on the stories that his brother has written. For example, in Katurian’s “The Pied Piper of Hamelin,” a man is kind to a boy he finds on the street, sharing a sandwich with him, but then proceeds to bleed the child to death by cutting off his toes. While this murder is being investigated by Ariel and Tupolski, Michael finally confesses to his brother that he is the child murderer. Violence is hard to depict on stage, especially the description of traumatic acts upon children in this play. One unforgettably horrific tale, “The Little Jesus,” describes the story of a young girl who is beaten and crucified in the same way that Jesus was in the bible. Murphy, however, finds a way to represent it – by making these acts appear as shadows behind a screen. This approach is interesting, as the director does not shy away from addressing the brutality of the play, but still maintains a certain distance from it. Tucher’s performance is particularly extraordinary; without leaving the stage for the entire two-and-a-half hour show, she manages to carry her troubled character through his final death. Magnificent at the end of the show, with blood dripping down her face as her vision is obscured, she whispers, “I was a good writer. It was all I ever wanted to be. And I was. And I was,” she repeats, right before Tupolski pulls the trigger.